If your toddler is a delightful angel when it comes to brushing their teeth, then please feel free to completely disregard this post and its contents. In fact, perhaps you should be writing this post and sharing your secrets! If however, like us, you have a toddler who equates the pleasures of teeth brushing to that of being skinned alive then maybe, just maybe, you might find something useful here. We have recently turned a corner with brushing Buddy’s teeth after countless tantrums and tears (from all three of us) and Buddy now asks for his teeth to be brushed! So here are some tips that have worked for us, and some awesome tips from other bloggers too. Hopefully you will find the key to tear free tooth time too! Let them pick their tooth brush. Buddy is now the proud owner of three tooth brushes all of which he chose himself. If he picks up a new toothbrush whilst we are out shopping I consider it a small price to pay for a happy brushing experience. Change your toothpaste. We found a huge improvement simply by changing from Bubblegum flavoured toothpaste to Strawberry. Buddy actually willingly opens his mouth for his teeth to be brushed since we switched flavours. To keep things interesting, why not have a selection of flavours? Brush at the same time and in the same place. Buddy loves routine and has always thrived on it. We brush his teeth whilst he is sat in his high chair each morning after breakfast and in the bath, last thing, every night. Obviously sometimes it isn’t possible to do exactly the same thing every day, however we have always found consistency (as much as possible) is key. Brush your Teeth with them. I hate this one, but it worked. I hate brushing my teeth in front of other people, including my toddler but his favourite thing to do is to copy Mummy and Daddy. Brushing his teeth is no different. Sometimes, if Buddy is being resistant, I let him brush my teeth whilst I brush his. Works like a charm. Include Toys. Vanessa at Mama’s Happy Hive suggests including favourite toys in the Tooth Brushing fun. Rupert might get a bit soggy, but if a soggy Rupert means a happy Buddy with nice sparkling teeth, I’ll take it! Tell a Story. Erica at What Do We Do All Day suggests turning teeth brushing time into a story time too! Make one up or read an old favourite. Learn with Play. Check out some of these super fun Tooth Brushing Activities from Anna at In the Playroom. Perfect for tactile kids and toddlers, these activities will make brushing teeth exciting for even the most resistant brushers! Don’t stress about it. Yes, brushing toddler’s teeth is important, but the more stressed out and uptight you are about it the more your toddler is going to resist it. And we all know how that goes…. 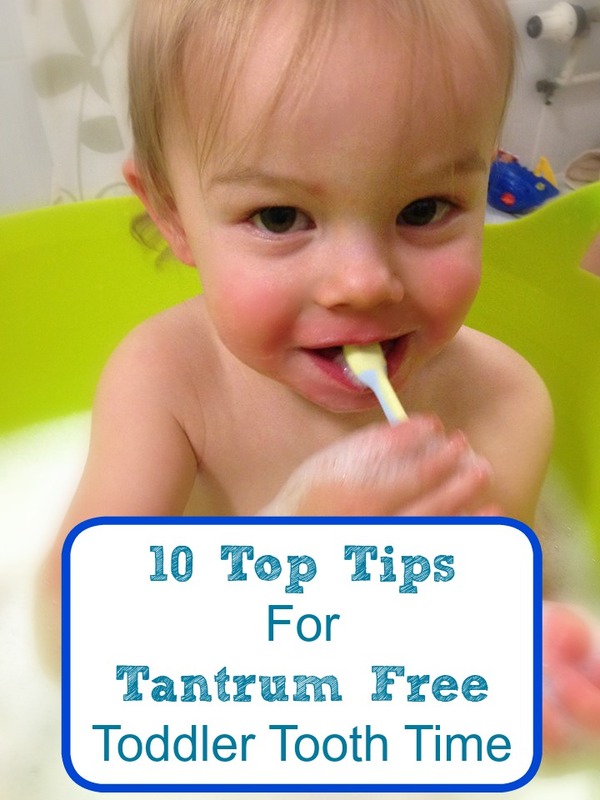 I hope these tips are useful to you if you are stuck in a tooth brushing nightmare with your toddler, or even if you just fancy trying something different! I love comments, so please let me know if these work for you. If you brushing your teeth with your child makes them more apt to do it, why not!? Most of us could stand to do a better job brushing anyway, so if you brush twice at night it’s not going to hurt you!